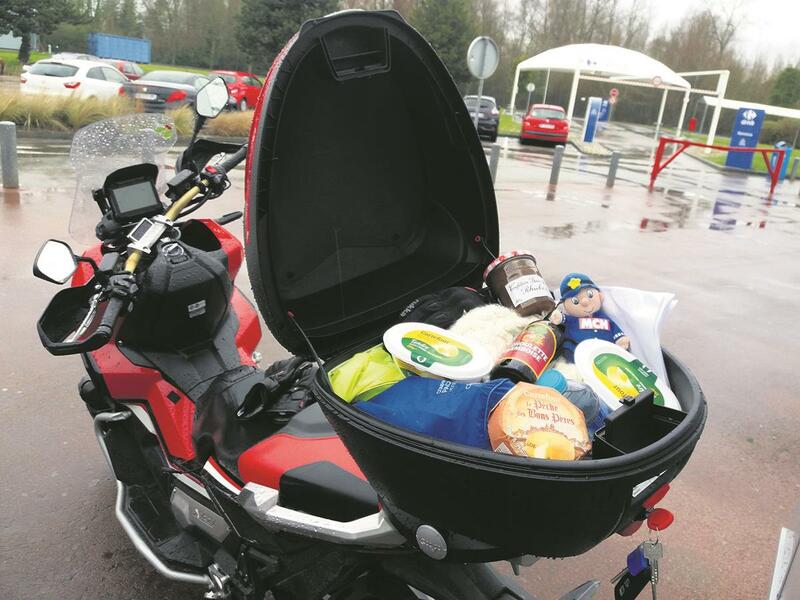 Alison, our Office Manager, has used this Givi top box on her Honda X-ADV, it suited her well for the daily commute and foreign jaunts. Givi products are good quality and this 34-litre top box and base plate are no exception. I was surprised how much I could fit into the 34 litre case. It was large enough to hold my kit for a weekend touring in France and had enough space for some edible French fancies I stowed on the way home. I've used it for my daily commute, my laptop will lay flat in the base and my daily essentials, which include packed lunch and gym kit, fit with ease. It’s shaped to hold a full face and my size small fits with ample space around it. When it is fully loaded and removed from the bike, it's cumbersome. The handle is integral to the the box and the position means when it's carried I have to awkwardly twist my wrist, which is downright uncomfortable.